You wander through the liquor store, idly glancing at the labels on the multitude of bottles. While searching out your selection, did you ever wonder what’s involved in creating these labels? While the design process for a liquor package can be a long and winding road, some of the final steps can be the most difficult. Specifically, every spirits label must be approved by the Federal government’s Advertising, Labeling and Formulation Division (ALFD) of the Alcohol and Tobacco Tax and Trade Bureau (TTB). The end result is a COLA. No, not the kind you drink; that’s a Certificate of Label Approval. Wow. That’s a whole lot of bureaucracy in those names alone. While meeting with spirits writer Allison Alsup on another matter, the topic of spirits labels came up and I mentioned a few of the requirements. Intrigued, Allison proposed a story exploring the sometimes-maddening minutiae of the spirits label approval process. 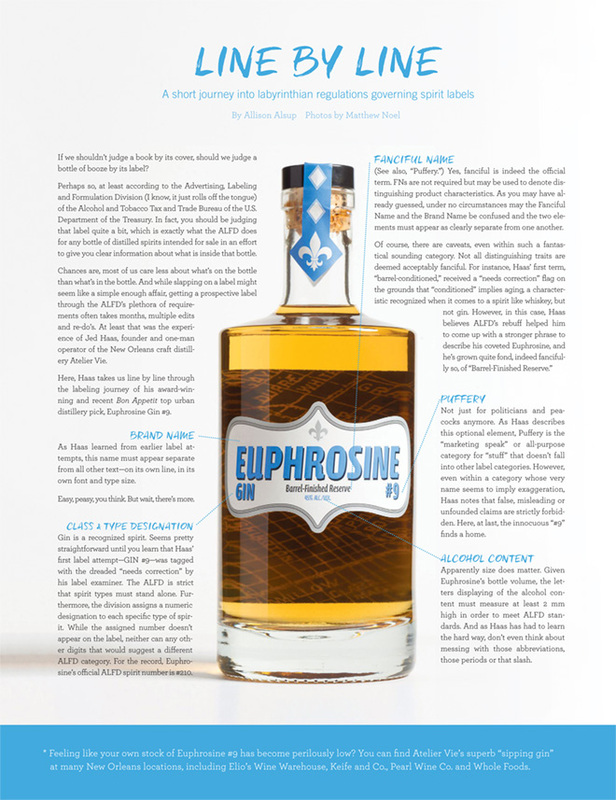 Look on pages 21-22 of the Summer 2016 issue of Edible New Orleans, or read the full article online. This entry was posted in Atelier Vie, Barrel-Finished Reserve, Press Hits. Bookmark the permalink.